Everyone here at SharperUniforms.com wants your staff to look their best. One of the best ways to keep everyone looking like part of a team is with a logo on their uniform shirt. Having a logo also helps customers find your staff. If they make a mental association with a logo, they’ll have an easier time identifying the potential of your company and its services. We have two great options for getting your name out there! We have a full range of embroidery and logo creation services, so you’ll certainly be able to find the option that works for you. You can choose up to three lines of embroidery text in several different fonts. If you have a logo design, SharperUniforms.com can create the embroidery for you! All you have to do is send us an electronic copy of the logo. You can get more details about this convenient service on our Embroidery Details page. Another great option for putting logos on uniforms is the use of heat seal technology. These heat applied transfers are made of non-fading, non-peeling, non-cracking material. When you use the heat seal logo application, you have a bit more freedom as to where the logo can be applied. 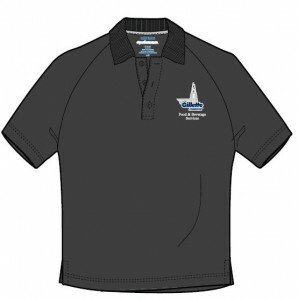 You can put a logo on shirt collars, cuffs, pockets, and plackets. You can be a little freer with this kind of logo application, also. Your color selection is larger, and you can use some finer details. Learn more on our Heat Seal page.